Through the efforts of R & D, Aaron finally manages to develop an improved version of the Li Gui Wei Er, but in order for him to hand over the new formula, Aaron has a condition, that is Yang Guang. 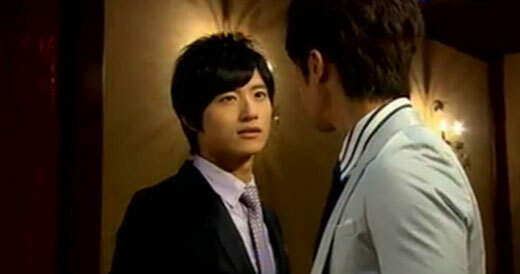 Ya Xin immediately rejects Aaron once hearing the condition of Aaron, as he is willing to sacrifice the Li Gui Wei Er built by his father single-handedly rather than losing Yang Guan! After seeing the determined Ya Xin, expression of Aaron turns to smile, turned out he just wanted to test the attitude of the Ya Xin towards Yang Guang. Seeing Ya Xin can sacrifice achievement for Yang Guang, he can rest assured to hand him Yang Guang. On the other hand, An Qi who has amended and wants to get rid of manipulation by Geng Fei, is using honey trap to get hold of inspection report for Nai Te Er developed by Geng family, in order to give to Ya Xin as the favorable evidence to revenge. Geng Fei does not expect he finally fails in the hand of his beloved woman, and starts to not understad what he is fighting for for all these time. So he does not want to do unnecessary struggle and decides to do according to script till the end. So what supposedly to be the new product launch conference for Nai Te Er, turns into the product launch event for Li Gui Wei Er II under the planning of Ya Xin and cooperation from Geng Fei. This makes the Geng Fei’s father below the stage utterly discomfits, and also makes Geng Fei and his father get arrested for squandering case. Ya Xin and Geng Fei becomes friend again when they meet. After everything is settled, Ya Xin who takes back everything belongs to him feels that he can give happiness to Yang Guang, so he dates Yang Guang in Shanghai’s house, ready to complete the last ritual of courtship that was interrupted previously. Angela who has guilty of conscience tells Yang Guang that it’s her who hit Yang Guang’s grandmother. Yang Guang forgives her and promises both of them will continue to be good sisters. Angela gives herself up to police on returning to Taipei. In theory, the prince and princess should live happily from the day of onwards. Unexpected, Yang Guang still refuse the marriage proposal of Ya Xin! Yang Guang has always believed that Ya Xin is getting carried away at a moment, that’s why he likes an ordinary girl like her. Ordinary as she, is better to law-abidingly return to Okinawa to pass her life normally, even even if the refusal of Ya Xin is how sad and heartache. She decides to use two years to confirm that their feelings are in fact real, and wants Ya Xin does not contact her in two years. Within the two years, Yang Guang regrets her decision, afraid that Ya Xin no longer love her. Two years later, a Okinawa’s nursery is full of vital sound of children, as Yang Guang teacher is asking them what they want to eat for lunch. “Curry,” “noddle,” and other tender responses fill the air, but this time came a familiar voice of a mature man, saying want to eat “Yang Guang sandwich.” Ya Xin is returning to Okinawa as promised, causing Yang Guang to believe in their love, and both be lover. Video clip of Ya Xin proposes to Yang Guang.